Luzia – a combination of two Spanish words for light, “luz,” and rain, “lluvia,” is the backdrop for a unique performance that unites traditional Cirque du Soleil elements with scenes and characters from Mexico. 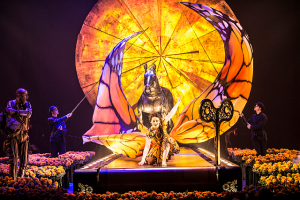 In “Luzia – A Waking Dream of Mexico,” acrobatic performances, beautiful costumes and music will not disappoint, even if they are somewhat expected in a Cirque du Soleil production. Luzia: A Waking Dream of Mexico is under the Big top next to the United Center now through Sept. 3, 2017. Photo courtesy of Cirque du Soleil. The show opens with a traveler parachuting on to the stage. He will guide the audience on a magical and comedic journey through time and space. After landing, he turns a large key and the show slowly begins to unveil the beauty of Mexico with a woman (Shelli Epstein) playing the role of the Monarch butterfly. Although the beginning may start off slowly, hoop-diving acrobats dressed in hummingbird costumes bring it back to life in the second scene as they go through their routines on moving treadmills. With each leap, the acrobats perform a series of moves with increasing difficulty and grace. As the show progresses from one scene to the next, the performers display their unique talents – balancing on one hand, flying from a trapeze and using aerial straps to move in ways you don’t expect. However, it was the water and light show that generated some of the loudest applause. There is an impressive, controlled wall of rain with gorgeous pictures projected on it. Everyone expects to be amazed, perplexed and amused by a Cirque du Soleil show. It’s a rarity to be made mildly queasy, but intentionally or not they pull it off with the most memorable and discomfiting positions of male contortionist Aleksei Goloborodko. Throughout the show, the traveler, Eric Fool Koller, ensures the youngest members of the audience will leave with big smiles on their faces as he takes turns playing the narrator and the more traditional, bumbling circus clown. Skillfully directed by Daniele Finzi Pasca, I highly recommend the show for both returning Cirque du Soleil fans and anyone who has never experienced the beauty and athletic abilities of this type of performance. Cirque du Soleil’s “Luzia, A Waking Dream of Mexico” will be playing at the United Center (Parking Lot K) now through Sept. 3, 2017. For tickets and other information visit Cirque du Soleil Luzia. Previous Previous post: Kiss and Hamilton and Shakespeare, really?